This is a new “mini” version of our workbook for second grade. It has all the same goals as our original workbook, but only one page of activities for each lesson. If you found that the original workbook had too much material for you to cover in class, then try this new version! 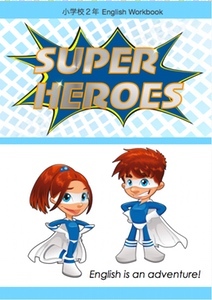 Our workbook for 2nd graders in Japan, “Super Heroes: English Handbook”, is an exciting resource to engage children via hands-on learning. The workbook contains 5 lessons, and is meant to be taught in a standard 45 minute class period. Review colors and shapes from 1st grade. To provide students with visual worksheets to help achieve language goals, without having to give explanations in Japanese. All instructions in the textbook are considered passive language, and students are not required to be able to read them. We include the instructions to expose students to written English. Super Heroes Mini:Part 1 Prints neatly in both B5 and A4 sizes. Super Heroes Mini:Part 2 Prints neatly in both B5 and A4 sizes.